Production Cost Insurance - Production Cost Insurance (PCI) is ideal for the producer with an operation committed to maintaining detailed and accurate records. 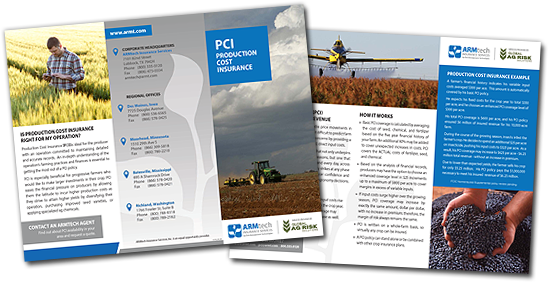 An in-depth understanding of the operation’s farming practices and finances is essential to getting the most out of a PCI policy. PCI is especially beneficial for progressive farmers who would like to make larger investments in their crop. PCI eases the financial pressure on producers by allowing them the latitude to incur higher production costs as they strive to attain higher yields by diversifying their operation, purchasing improved seed varieties, or applying specialized ag chemicals. Click on this brochure for more information.